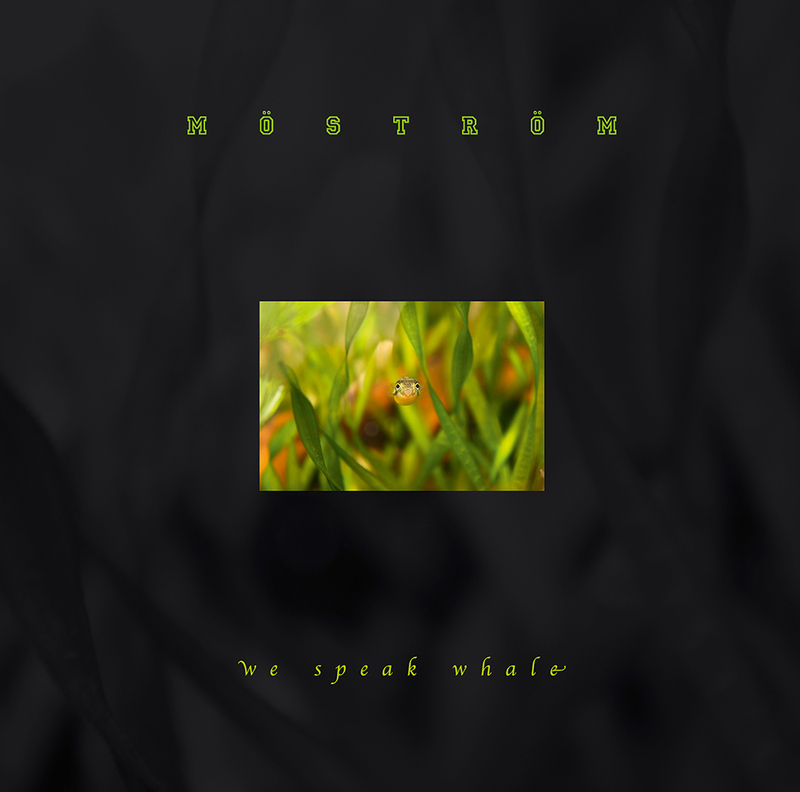 Ears will drop jaws while the listeners of we speak whale become increasingly fascinated with every chord. The first release of möström doesn´t even bring up the question whether experimental music is inaccessible or hard to get. In fact you will hardly find anything sounding as thrilling and balanced at the same time. Experience propellering synthesizers, haunting melodies, sleepy plonking honky tonk, minimalistic hints of pop, a calming pulse, packed soundscapes, maelstrom of noise, manic and brittle sculptures and - the sea. After listening to 40 minutes of overhelmingly playful music with all its suprising twists you might feel affected by amnesia - just like Dory, the palette surgeonfish who, by the way, speaks whale. This is the result of the vast variety of musical impressions hitting your ear you are not able to put nametags on. The blowfish – also known as Fugu, a Japanese dish, a balancing act between tetrodotoxin poisoning and intoxicating euphoria - is not only represented on the cover: sweet and tiny or huge and deadly dangerous. The journey starts at the “Werft” (engl. : Dockyard) where you will find the base for what is going to come. From there the band takes you further and further out into the open sea. Susanna Gartmayer, playing the bass clarinet with virtuosity, making adventurous tonal fissures, groovy licks, melodies soft as velvet paws and anything else happen. Tamara Wilhelm squeezes out voluminously sounds out of her self-and-easy-to-build electronic sound devices. From beat to squeaking, walls of guitar to little space animals, hear the impossible. Elise Mory knows how to turn the knobs and hit the keys of her red and golden machines. This means melting down sounds, crystallising tiny melodies and drowning pianodrones. You might have heard them in projects and bands like The Vegetable Orchestra, broken.heart.collector, Gustav, Nitro Mahalia, subshrubs and many more. Möström fishes in the pool of Vienna´s off scene without the use of a trawl since 2010. Diving for pearls in the wide sea of - what exactly? Experminental Noise Pop? Independent academic sound art? Instant Composition? Discreetly abstract Soundscapes? WTF? Get ready for a unique variety of musical treasures brought into life with a great sense of humour! Released by Unrecords and definitly Unrecord of the year. Die Faszination wächst im Hören und dem Gehör bleibt die Spucke weg. Die Frage nach einer vermeintlichen Unzugänglichkeit experimenteller Musik stellt sich bei der ersten Veröffentlichung des Trios "möström" erst gar nicht. Tatsächlich wird man kaum etwas finden, das nur annähernd so spannend und ausgewogen zugleich tönt. Synthesizergeschwurbel, ohrwurmartige Melodien, verschlafenes Geklimper, minimalistische Pop­Anstreifung, entspannter Puls, verdichtete Klanglandschaften, sog-artiger Lärm, durchgeknallt spröde Gebilde ­ und das Meer. Fast wähnt man sich, ganz wie Dory, die walsprechende Palettendoktorfischin, betroffen von einer Amnesie, wenn man am Ende der Platte ­ inklusive Überraschung! ­ wegen der weitläufigen Verspieltheit und vieler unvorhergesehener musikalischer Wendungen nicht mehr in der Lage ist zu sagen, was in den letzten knapp 40 Minuten eigentlich alles geschehen ist. Der Kugelfisch ­ vor allem unter seinem Namen als japanische Speise "Fugu" bekannt, eine Gratwanderung zwischen Tetrodotoxin­Vergiftung und rauschhafter Euphorie ­ ist visuell stark vertreten, als Zwergfisch ganz dolce am Cover und als maximal aufgepumpter und maximal schlecht gelaunter Ballon am Label. Beharrliche Assoziationen beim Hören ihrer Aufnahmen spülten die Bandmitglieder immer mehr in Richtung Ozean. Die erste Nummer heißt demnach auch "Werft", hier wird der nötige Untersatz für die folgende Reise zusammengeschweißt. Susanna Gartmayer virtuos an der Bassklarinette, abenteuerliche Spaltklänge, groovige Licks, samtpfotene Melodien ­ alles da. Tamara Wilhelm fiepst und knurpselt mit selbst zusammengelöteter Soundelektronik einfachster Bauart, weniger ist mehr, manchmal kommt sogar ein Beat daher. Auch Elise Mory weiß an ihren etwas größeren Kisten zu schrauben und den roten und goldenen Keyboards Prachtexemplare der Klangsynthese zu entwinden. Allesamt sind sie bekannt aus Projekten wie Gustav, dem Gemüseorchester (The Vegetable Orchestra), den Bands broken.heart.collector, Nitro Mahalia, subshrubs und und und... Seit 2010 fischt die Band im Pool der Off­Szene in und um Wien, Schleppnetze sind dabei nicht ihr Ding, eher tauchen die drei im Unterhemd nach Perlen im weiten Meer des, was eigentlich? Experimenteller Noisepop? Independent academic sound art? Instant Composition? Diskret abstrakte Soundscapes? MFG? WTF?. Auf "we speak whale" werden musikalische Schätze von einzigartiger Vielfältigkeit zu Tage befördert, und das mit einer Menge Humor! Erscheint bei unrecords und definitiv Unplatte des Jahres! "Eine ungewöhnliche und faszinierende Reise in eine weit entfernte, fremde Klangwelt, genau auf eine solche begeben sich die drei Musikerinnen SUSANNA GARTMAYER, ELISE MORY und TAMARA WILHELM mit ihrem Trio MÖSTRÖM auf ihrem soeben erschienenen Debüt „we speak whale“ (unrecords). Nun, nach den gewöhnlichen musikalischen Regeln läuft auf dieser Veröffentlichung nichts, aber auch wirklich rein gar nichts ab. 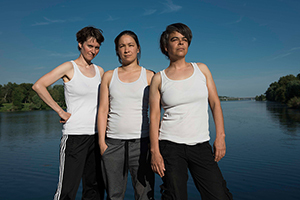 Susanna Gartmayer (Bassklarinette), Elise Mory (Keyboards, Klavier) und Tamara Wilhelm (DIY Electronics) – die drei Köpfe hinter diesem sehr eigenwilligen Projekt – haben sich als ihr gemeinsames Betätigungsfeld eine Klangumgebung auserkoren, die in absoluter Entfernung zu dem angesiedelt ist, was geläufig als „musikalisch“ bezeichnet wird. Stilistisch benennbar ist das, was die drei musikalischen Freigeister zu Gehör bringen, eigentlich nicht. Am ehesten lässt sich der Sound von Möström noch als irgendetwas zwischen Neuer Musik, Elektronik, Industrial, Improvisation, Jazz, Pop, Noise und Elektroakustik beschreiben, wobei auch diese Musikformen nur als grob eingeschlagene Eckpfeiler herhalten. [...]"
"With the press bumpf being in German, I was lost in trying to translate anything relating to the artist (with my limited knowledge); so it was just down to slotting in the CD and seeing where it goes. ‘We Speak Whale’ is barking mad; laugh out loud even. Blasts of noise, wonky piano and bass clarinet are the backdrop of tracks such as ‘Humpty Dumpty’; whilst the title track is a collection of instrumentation that try to do just what it says on the tin. Some of this is actually good on an outright noise artist level; the rest is plain ludicrous. Nothing is uniform, but there is time for some hilarity and I have to admit actually enjoying some of the insanity that prevails; especially on the downright bonkers, ‘Spuckspielautomat’. In all honesty, I could have torn this limb from limb; but it made me laugh too much to be nasty. It is bloody awful and no mistake, but somewhere in there it’s pretty damn obvious these guys know how to play their instruments; so I will let them off. Nothing more to say, I will just sit here, chuckle and scratch my head in confusion." "La Vegetable Orchestra negli ultimi dieci anni è stato uno dei progetti più bizzarri e creativi applicati al mondo della sperimentazione elettronica, inusuale ed ironico quanto basta per poter attrarre su di sé le simpatie e l'interesse di un pubblico vasto ed appassionato. A margine di questa vicenda, i due membri dell'ensemble Susanna Gartmayer (clarinetto basso) e Tamara Wilhelm (live electronics) si sono unite alle tastierista Elise Mory per ritagliarsi uno spazio autonomo del nuovo progetto Möström, caratterizzato anch'esso da un'immaginazione fervida, sempre in grado die spiazzare l'ascoltare con repentini sbalzi umorali e continue trasformazioni. Talvolta la loro musica si accorpa in strutture simmetriche dai contorni ben definiti (Spuckspielautomat) o in brani armonici che hanno la capacità die innestare i Tuxedomoon nel krautrock (Emoticon) e i Maximalist! nella muzak di Perrey & Kingsley (I Dream of Jeannie), altre volte tutto si disperde in improvvisazioni frammentarie in cui il flusso elettronico diviene astratto (Kugelfisch), oscurro (Karlsplatz) e dissonante come nella tradizione pionieristica alla Morton Subotnik (la title track). Un progetto interessante, a metà fra free form ed un'idea inusuale die composizione ai margini del rock più visionario." "Austrian trio Möström's debut album, We Speak Whale sweeps the listener into an addictive, mesmerising water-world of sound. The Viennese group utilise a myriad of instruments in their work – hardly surprising when you consider that two of the band members, Susanna Gartmayer and Tamara Wilhelm have also performed with The Vegetable Orchestra – who, as their name suggests, create vibrant tunes with ordinary, everyday vegetables. "We Speak Whale is the place where the side-alley jazz club is scorched by the erratic zaps of a tesla coil, before the whole mess is immortalised as a thick gelatine of bass frequencies and phasers, and then tossed into a dumpster of old radios, hospital equipment and discarded orchestral instruments, where white noise echoes all the way down to the bottom. Because the creative reflex is softer and more pliable than most musicians would have you believe, and the train of thought can take sharper turns than you realise. Möström are not formless, but they are certainly boneless, boundless – willing and able to make their stylistic fingertips touch their stylistic toes, mutating from dirty electronic squelch (led by the rotary rhythm of clarinet) into the bleeping, rumbling apprehension of a nuclear meltdown felt from the control room, and then again into a pretty rainfall of piano and radio waves…all without a droplet of caution or doubt." 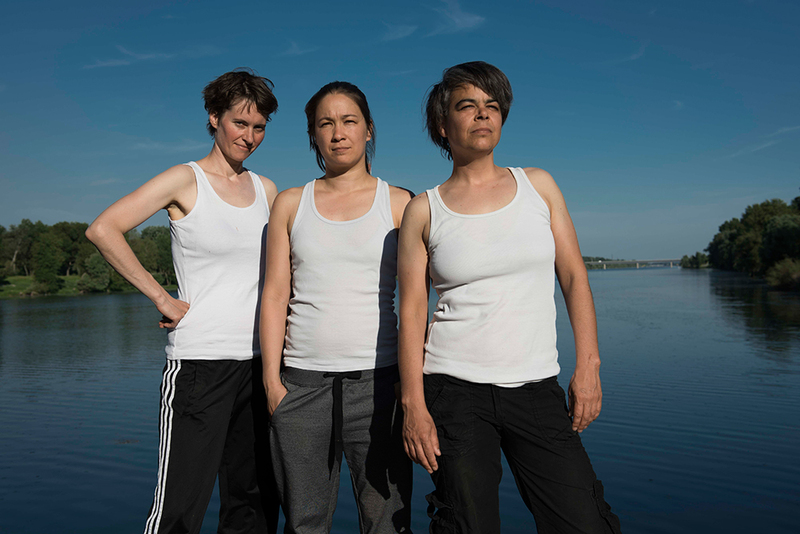 The Viennese trio of Susanna Gartmayer, Elise Mory and Tamara Wilhelm has fallen in love with the opposite of opposites, but something has been changed (added, not lost) in translation. we speak whale is the avant-garde representation of Dory from “Finding Nemo”, a Dory who smokes cigarettes and fidgets on a barstool, telling stories she can’t quite remember. The result is unusual and alluring. Take for example “Humpty Dumpty”, which begins with a nursery title and does in fact include the crashes one might associate with falling ~ until the bass clarinet and piano duet in honky-tonk fashion, lending a shimmer of happy chaos to the whole proceeding. Oh but then – crash! boom! fuzz! Oh, Humpty. You should not have danced." "Drei Musikerinnen, Susanna Gartmayer - Bass-Klarinette, Elise Mory - Keyboards, Piano, Tamara Wilhelm - D.i.Y-Electronics, die gemeinsam eine Musik machen, die sich schwer beschreiben lässt, mich aber als Hörer, als sich am Rechner das erste Stück ihres Debüts We speak whale mit dem Titel Werft abspielt, laut lachen lässt. Ein Lachen, positiv und ungläubig, erstaunt und vor allem befreiend und befreit. Mehr Lachen, als Humpty Dumpty anhebt, der zweite Track. Musik zum Mögen. [...] Das Trio nimmt sich die Freiheit von improvisierter Musik mit, ohne deren Klischees zu reproduzieren, könnte wohl auch Jazz, Noise oder Pop, scheut weder den Dur-Akkord noch Kitsch, was immer das genau sein mag oder gar - Achtung! - Melodien. Diese Offenheit und Abenteuerlust tragen dem Trio strenge Blicke von bärtigen Freejazz-Polizisten ein, wenn sie in entsprechendem Kontext agieren, bewahrt aber die stete Spannung ihrer über Module der Instrumentalistinnen organisierten Musik, die im Mix und Master des wunderbaren Chris Janka selbst als Tonträgerkonserve - am Tisch liegt eine Vinyltestpressung - lebt, wie Musik das aufgenommen leider nur selten tut. [...]"